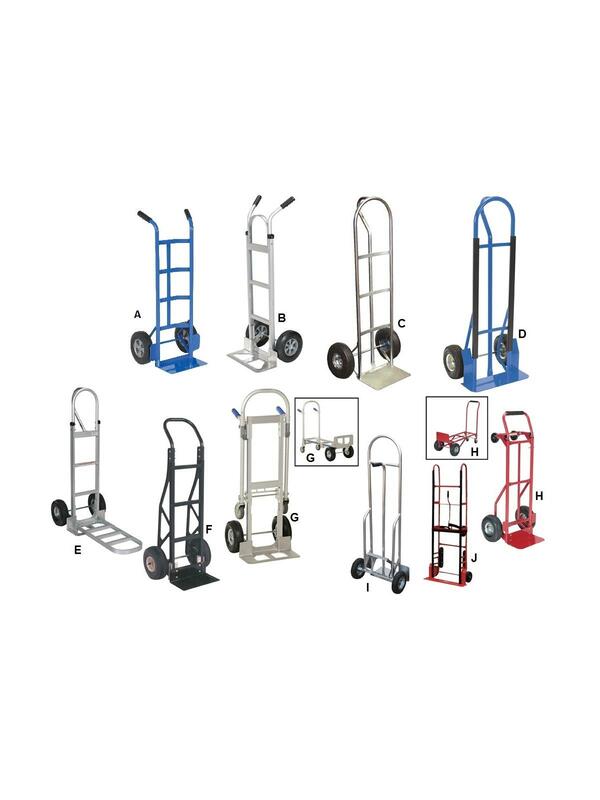 These durable, yet lightweight hand trucks are built to handle loads of up to 600 lbs. The toe plate has a beveled edge for sliding under loads. FOB Shipping Point. A) Steel Dual Handle...maximize control for different loads. B) Aluminum Dual Handle...maximize control for different loads. C) Steel "P" Handle...great to free up your other hand to open doors or handle material. Easy to steer and maneuver. D) Heavy Duty Steel "P" Handle...great to free up your other hand to open doors or handle material. Easy to steer and maneuver. Handles loads up to 600 lbs. E) Aluminum "P" Handle with Extended Nose Plate...lightweight, non-marking. Easy to steer. Features a steel nose plate. F) Fiber/Nylon Truck...transport lightweight loads. Non-marking. G) Aluminum Convertible...works in both the vertical and horizontal positions. 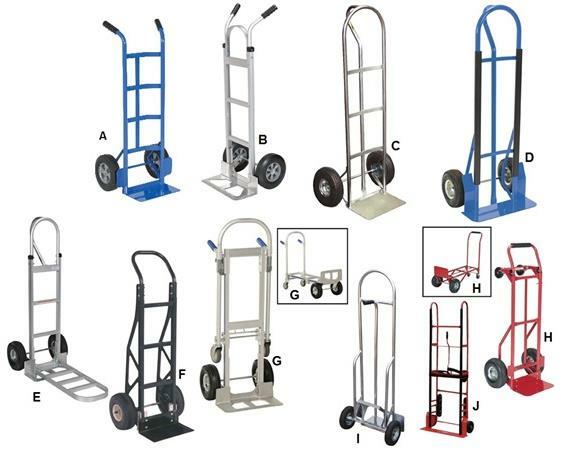 Easy to convert from hand truck to platform truck. H) Steel Convertible...works in both vertical and horizontal positions. 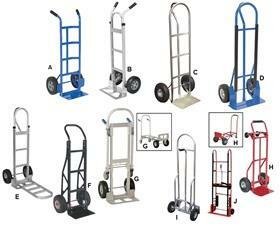 Easy to convert from hand truck to platform truck. I) Aluminum High Back...when the load has reached its final destination, the user simply pushes down on the back plate with their foot and the plate on the front of the unit will slide out the load. J) Appliance Carts...transport large heavy and odd shaped loads from area to area. Variety of the tie down methods. Ratchet Appliance... transport large heavy and odd shaped loads from area to area. Variety of the tie down methods. K) Vending-Appliance Cart Ratchet...this Appliance and Vending Machine Cart is ideal for moving large, bulky, heavy appliances, and awkward loads. A strap and tension bar are included with this unit to hold the product in place while transporting up or down stairways, hills, or uneven surfaces. Great for moving and maneuvering vending machines throughout the workspace (not shown). 22-1/2 x 17-1/2 x 44-1/2"22-1/2 17-1/2 44-1/2"